This term is used so loosely in the United States by writers and public speakers that a scientific definition appears to be a prerequisite to the proper understanding of its different phases. As it is often stated that Jews have been intimately connected with this movement it seems desirable to ascertain the extent of the connection. Anarchism is defined in "The Encyclopedia of Social Reform" (New York, 1897) as "the social doctrine of the abolition of government of man by man, and the constitution of society without government." There are two schools of Anarchism: the individualistic and the communistic. Communist Anarchism is of distinctively Russian growth. From the first, Jews in Russia allied themselves with this school and participated actively in its propaganda. It originated with the early Slavophiles of the "forties" in their mystical cult of the village community; was given a socialistic guise by Herzen and Tchernyshevski at the epoch of the peasant reform; was remolded and finally merged into Proudhonism by Bakúnin in the days of the International Workingmen's Association (1868-71). The individualistic Anarchism of Proudhon found a wide and responsive audience among the Russian educated middle class, and in the "sixties" was acclimatized in the guise of nihilism. Nihilism soon gave place to the Bakúnin-communist Anarchism, which held sway over the minds of the young generation of the "seventies." The anarchist movement had exhausted itself in Russia by 1881, and had given to the western world the most noted apostle of modern communistic Anarchism, Prince Peter Kropotkin. 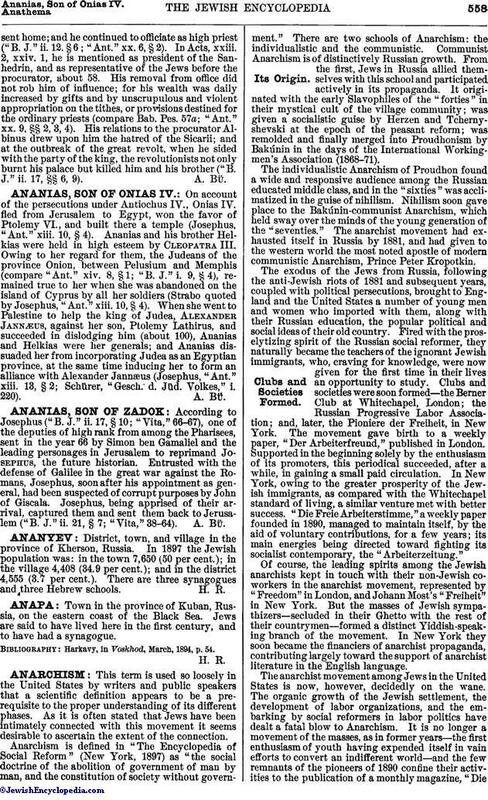 The exodus of the Jews from Russia, following the anti-Jewish riots of 1881 and subsequent years, coupled with political persecutions, brought to England and the United States a number of young men and women who imported with them, along with their Russian education, the popular political and social ideas of their old country. Fired with the proselytizing spirit of the Russian social reformer, they naturally became the teachers of the ignorant Jewish immigrants, who, craving for knowledge, were now given for the first time in their lives an opportunity to study. Clubs and societies were soon formed—the Berner Club at Whitechapel, London; the Russian Progressive Labor Association; and, later, the Pioniere der Freiheit, in New York. The movement gave birth to a weekly paper, "Der Arbeiterfreund," published in London. Supported in the beginning solely by the enthusiasm of its promoters, this periodical succeeded, after a while, in gaining a small paid circulation. In New York, owing to the greater prosperity of the Jewish immigrants, as compared with the Whitechapel standard of living, a similar venture met with better success. "Die Freie Arbeiterstimme," a weekly paper founded in 1890, managed to maintain itself, by the aid of voluntary contributions, for a few years; its main energies being directed toward fighting its socialist contemporary, the "Arbeiterzeitung." Of course, the leading spirits among the Jewish anarchists kept in touch with their non-Jewish coworkers in the anarchist movement, represented by "Freedom" in London, and Johann Most's "Freiheit" in New York. But the masses of Jewish sympathizers—secluded in their Ghetto with the rest of their countrymen—formed a distinct Yiddish-speaking branch of the movement. In New York they soon became the financiers of anarchist propaganda, contributing largely toward the support of anarchist literature in the English language. The anarchist movement among Jews in the United States is now, however, decidedly on the wane. The organic growth of the Jewish settlement, the development of labor organizations, and the embarking by social reformers in labor politics have dealt a fatal blow to Anarchism. It is no longer a movement of the masses, as in former years—the first enthusiasm of youth having expended itself in vain efforts to convert an indifferent world—and the few remnants of the pioneers of 1890 confine their activities to the publication of a monthly magazine, "DieFreie Gesellschaft," devoted to a popular discussion of their sociological theories. Neither of these schools of Anarchism is necessarily other than pacific. But militant Anarchism has also been represented among the Jews, in the person of Alexander Berkmann. It will be recalled that he attempted the life of H. C. Frick, manager of the Carnegie Steel Company, during the Homestead strike in the summer of 1892, and was sentenced at Pittsburg, Pa., to twenty-two years' imprisonment in the penitentiary. Berkmann's case can not be classed, however, with the deeds of the European militant anarchists, whose blows are aimed indiscriminately at any person belonging to the ruling classes or to the bourgeoisie. The victim chosen by Berkmann was a man who represented capital in an acute conflict with labor, which brings this case into close relationship with Russian terrorism. Individualist, or so-called "philosophical" Anarchism, which can as readily be traced to its Russian source, has had few Jewish adherents. Victor Yarros, one of the leading philosophical anarchists of the United States, is a Jewish disciple of Pissarev, the brilliant apostle of Russian nihilism (in the Turgeniev sense of the word). 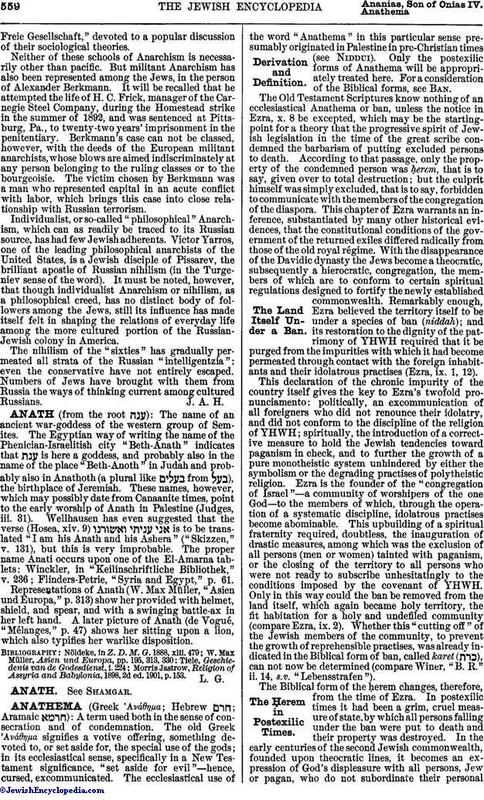 It must be noted, however, that though individualist Anarchism or nihilism, as a philosophical creed, has no distinct body of followers among the Jews, still its influence has made itself felt in shaping the relations of everyday life among the more cultured portion of the Russian-Jewish colony in America. The nihilism of the "sixties" has gradually permeated all strata of the Russian "intelligentzia": even the conservative have not entirely escaped. Numbers of Jews have brought with them from Russia the ways of thinking current among cultured Russians.